NETWORK FINALS: The 2 hours of DATELINE dropped 0.1/0.2 in final numbers. 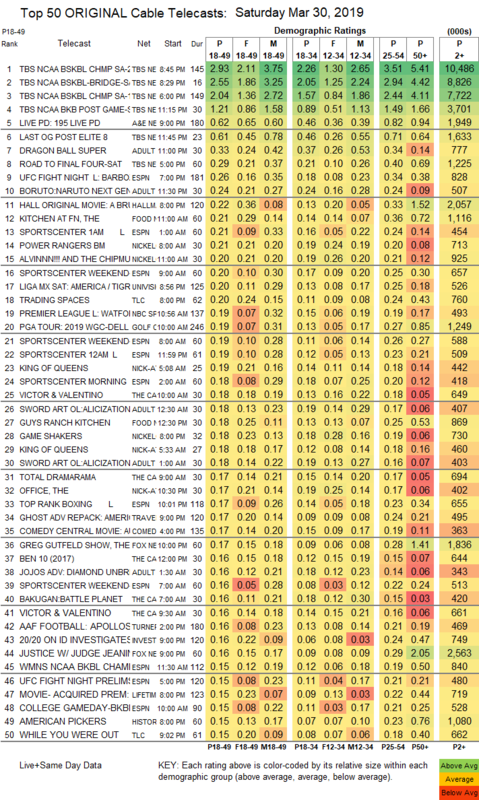 CABLE HIGHLIGHTS: TBS ruled Saturday cable (and broadcast) with its NCAA TOURNAMENT coverage, led by its 2.93 for the Purdue vs. Virginia game, and an 11:45PM post-game airing of THE LAST OG was at 0.61. A&E’s LIVE PD returned from a break at 0.62. Adult Swim’s line-up performed as follows: DRAGON BALL at 0.33 and 0.10/232K & 0.14/340K compared to last week’s 0.41 and 0.09/304K & 0.12/345K, BORUTO down 0.04 to 0.24, MY HERO ACADEMIA down 0.01 to 0.23/498K, SWORD ART ONLINE at 0.18/0.18 compared to alst week’s 0.19, JOJO’S BIZARRE ADVENTURE down 0.01 to 0.16, BLACK CLOVER down 0.02 to 0.15/330K, HUNTER X HUNTER down 0.02 to 0.14/279K, NARUTO down 0.04 to 0.12/294K, and ATTACK ON TITAN steady at 0.12/272K. Food Network’s DINERS, DRIVE-INS & DIVES was at 0.24, with KITCHEN AT FN up 0.02 to 0.21, GUY’S RANCH KITCHEN steady at 0.18, and PIONEER WOMAN down 0.04 to 0.16. Hallmark’s original movie A BRUSH WITH LOVE was at 0.22. Nickelodeon’s morning POWER RANGERS was at 0.21 and ALVIN & THE CHIPMUNKS was at 0.20. Univision’s LIGA match was at 0.20. 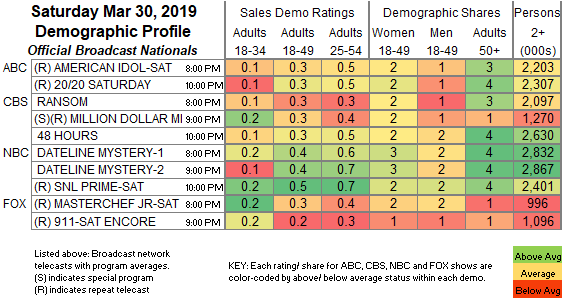 On TLC, TRADING SPACES gained 0.02 to 0.20, WHILE YOU WERE OUT was steady at 0.15. Lifetime’s original movie THE KILLER NEXT DOOR was at 0.15. Syfy’s ALIEN NEWS DESK gained 0.02 to 0.09. OWN’s FAMILY OR FIANCE was at 0.08/0.08, compared to last week’s 0.13.